1. 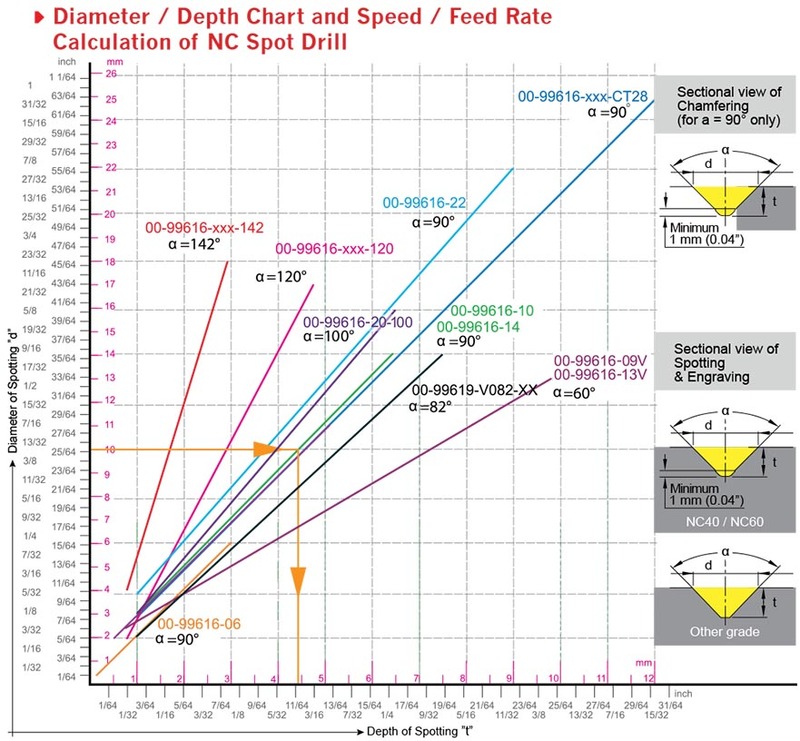 Using your “d” value and cutting speed Vc from the data sheet, calculate spindle speed “S”(RPM). f Feed rate per tooth mm/rev. (Vc (m/min.) x 3.28) ft./min. 1. From Spot diameter “d” to get drill depth “ t ”. 2. Point angle “α” is determined by which tool holder you use. 3. From “d” draw a horizontal line to get intersection of the line by point angle “α”. 6. For chamfering, do not use tip of insert, 1mm(0.04”) minimum clearance is required for a smooth surface finish. • Choose spotting depth to decide spotting diameter according to the Diameter/Depth chart. • The spindle speed should be calculated by the maximum diameter of spotting, chamfering and grooving. * For technical construction reasons, the insert is not located on the center of the holder. * Inserts with supporting edges can increase feed rate 50%.